Phase Collection uses raw, rough gems and minerals as the focal point of each piece of jewelry. Phase Collection honors the natural aspect of the gems and minerals utilized, and reflects this vision in each handcrafted piece. An ode to the moon and inspired by strong women, Phase Collection was designed to fit seamlessly into any style at any phase of your life. Each handmade piece is meant to serve as a small reminder of the power that lies within each of us, and of our connection to something larger than ourselves. My name is Cala, and I am the designer for all that is Phase Collection! I’ve felt a love for gems and minerals ever since I was little. My grandpa and uncle both made and designed jewelry as a hobby in the past. I always loved looking through my grandpa’s extensive mineral collection, and loved the jewelry my uncle designed for Christmas for us each year. Both have since passed away, but it feels very special to focus my creativity into continuing jewelry making, while utilizing the more modern technique of electroforming. I have always been surrounded by strong women who supported me and encouraged me to push myself, from my mother and grandmother, to the wonderful friends I have made throughout the years. Recently I was inspired by a group of amazing, talented people in my life, and that was the final push I needed to create this collection. I hope each handmade piece brings you as much joy as it has brought to me, and that each serves as a small reminder to be more introspective, more positive, more passionate, and to love yourself just as you are. 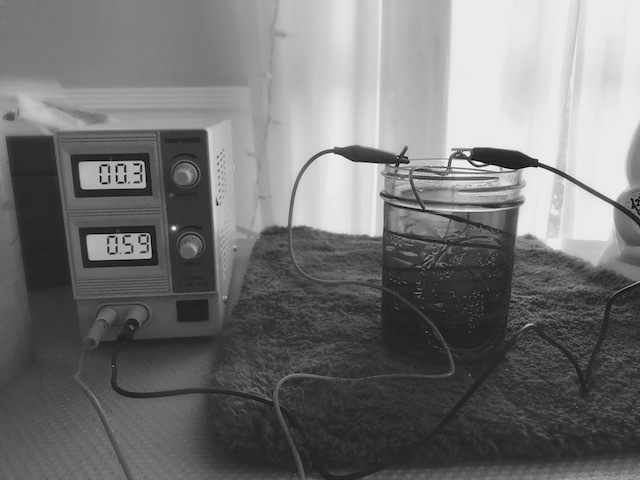 Electroforming is a bit of a science experiment. It involves electroplating: Depositing metal onto a conductive surface, which in this case is copper surrounding gemstones and minerals. While electroforming is a very extensive process and involves several steps that even include sculpting and painting, above all else it requires a lot of patience, care, and passion.